Frontline women activists representing over 20 countries will remind member states of their legal obligation to protect human rights on 20th anniversary of human rights declaration. Women from Guatemala, Nicaragua, Syria, India, Philippines, the United States and other nation states are scheduled to share their testimonies of violence and the state of their communities in the wake of rising fundamentalisms, political populism, and unchecked authoritarian rule. They will also share their strategies for collective protection and recommendations. Human rights coalitions and non-governmental organizations such as Amnesty International, Association for Women’s Rights in Development, JASS, the Consortium of Urgent Action Sister Funds (Urgent Action Fund and Urgent Action Fund -Latin America), and the International Service for Human Rightscollaborated with the UN Special Rapporteur on Human Rights Defenders to hold space for this discussion during the 22nd session of the UN Working Group on discrimination against women in law and in practice. In the past year, more than 300 human rights defenders have been murdered for their political work.1The goal of this high-level event is to facilitate the direct participation of grassroots activists in UN spaces. 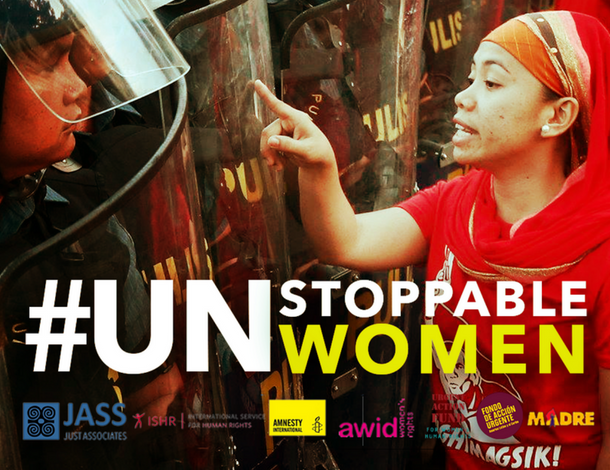 Historically the UN has been criticized for its bureaucracy and body politic but women’s rights groups are committed to increasing the accessibility of the UN as a platform by ensuring that the experiences of frontline activists inform policy, and that both they and their work are protected. The Declaration on Human Rights Defenders has provided women’s rights groups and activists with a strong pragmatic text with which to argue for their protection. It emphasizes that the global human rights movement involves us all.2 But systemic violence continues to rise around the world, and women’s human rights defenders face additional gender-based discrimination when they step out of what are prescribed as socially appropriate roles for women. In particular, women activists who promote sexual and reproductive health and denounce the actions of capitalist projects such as mining and logging face grave risks and reprisals. Fundamentalist movements are not curbing their scale or pace in 2018 but either are the efforts of the courageous and determined women fighting to dismantle them. Women’s human rights defenders will continue to convene following the event to strategize and participate in a learning exchange together. If you wish to learn more or contact them directly for statements please email olivia@urgentactionfund.orgfor more information. This is a statement by Jass, AWID, Frontline Defenders, ISHR, Amnesty International, Urgent Action Fund, Madre on July 26, 2018.